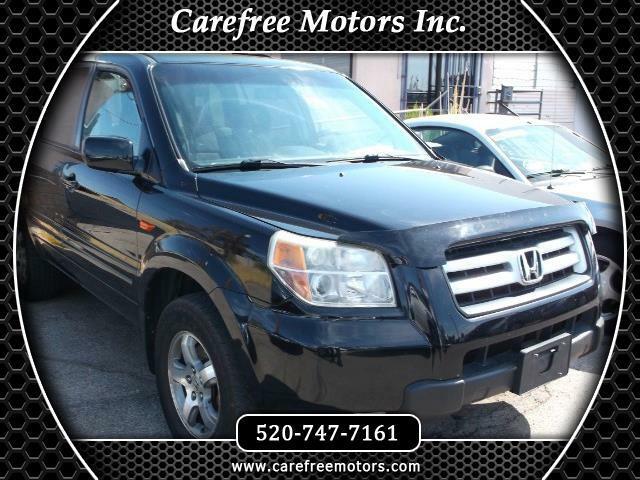 Used 2007 Honda Pilot EX 4WD for Sale in Tucson AZ 85710 Carefree Motors Inc. EXCELLENT 2007 Honda Pilot EX SUV 4 Door, V6, VTEC, 3.5 Liter, Automatic, 4 Wheel Drive, Traction Control, Stability Control, ABS (4-Wheel), Air Conditioning, Air Conditioning REAR, Power Windows, Power Door Locks, Cruise Control, Power Steering, Tilt Wheel, AM/FM Stereo/ Cassette/ CD/MP3 Player (Multi Disc), Dual Air Bags, Side Air Bags, Power Seat, Third Row Removable Seat, Privacy Glass, Roof Rack, Towing Package, Alloy Wheels, Fuel City/Hwy 17/22 MPG 237,377 Original Actual Miles. AWESOME PILOT!! NOW ONLY $4995.00! !